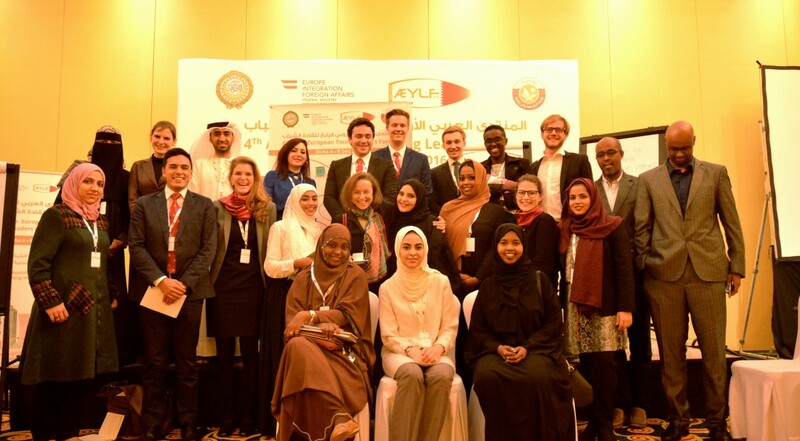 In the first week of December I participated for Pangaea Project and my university, the Diplomatic Academy of Vienna, at the 4th Arab- European Young Leaders Forum (AEYLF) in Doha. The event, organized by the Austrian Ministry for Foreign Affairs and the Qatari Ministry of Youth, gathered more than seventy young people from the Arab world and Europe and provided the opportunity to get to know each other, dispose of misconceptions and make new friends. First, I engaged in discussions in the thematic working group on sustainable development and environmental protection. We talked about the many aspects of development and that we cannot address one issue such as nature protection without recognizing the importance of other parts of development such as education. One should take a comprehensive approach to sustainable development, incorporating among others the economy, education, environment, agriculture and security. In the group we also shared national experiences and concluded that countries, including within the Arab world, face different challenges, but that climate change is an important issue everywhere, also Austria. Other topics we discussed were environmental pollution, water management and population growth. Especially the last one may pose challenges to the Arab world in the future, since more people need more water, food and energy. We had an interesting discussion because our awareness of population growth and resource consumption varied. One young Somali man said that the country needs many young people to build up an economy, care for the elderly and there is enough space anyways. We also asked participants from the Gulf countries what they think will happen after the extraction of oil? This way, I learnt that for instance Bahrain actively tries to shift away from oil and gas towards an economy that’s more based on human capital and trade. Moreover, there was an interesting presentation by the Qatari authorities on the sustainability plan for the FIFA World Cup 2022. Many of the stadiums will be dissembled after the event and shipped to developing countries to provide sports facilities. There are also plans to build greenhouses out of parts of the infrastructure. This would allow Qatar to produce some own food and not to have to import as much. Additionally, the five days of the forum consisted of a great cultural program. We went into the old souk of Doha, spent a day in the beautiful desert for teambuilding activities and discovered the sports academy “Aspire”. Most importantly, I learnt a lot interculturally. The Arab world is geographically so close to Europe – literally our neighbours. Still, I knew very little about it before the forum. This way, I learnt about religion and its role in everyday life by talking with young Muslims. I learnt about countries such as Djibouti and Sudan, which I definitely want to visit one day. And lastly, I learnt to appreciate what young motivated people do in Arab and European countries. Be it working and fighting for education in Yemen, for environmental standards in Tunisia or for mutual understanding in Somalia. It’s reassuring to know that these great young people exist. Because as one participant said: Yes the forum was amazing and important, but its success will be measured in what we make out of it and implement back home.